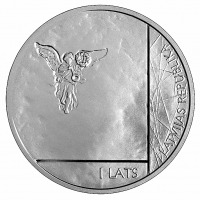 The obverse shows an angel (an architectural detail of the Riga Cathedral) on the left, a semi-circled inscription LATVIJAS REPUBLIKA (Republic of Latvia) on the right, and 1 LATS at the bottom, all in enclosed segments. 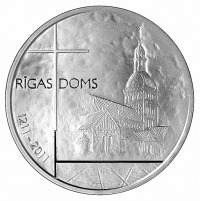 The reverse displays the building of the Riga Cathedral, with the inscription RĪGAS DOMS (Riga Cathedral) split by cross on its left, and the years 1211–2011, arranged in a semicircle in the left lower part. Two inscriptions Latvijas Banka (Bank of Latvia) separated by rhombic dots. 25 July 2011 marks the 800th anniversary of the date when a cornerstone of the Riga Cathedral, a Latvian holy place and sign of God's presence in this country, was laid. Assembling people, the Riga Cathedral has always pointed at the transcendent that stands above us all, above the times and the changes they bring. The Riga Cathedral has served this purpose with the help of both music and other arts, lifting people out of the quotidian. It is the place for events that are greater than man and his short life and leave ageless traces. The Riga Cathedral is the home of the Latvian Evangelical Lutheran Church where the most important services take place. Its spiritual life is formed and fostered by the Riga Cathedral's congregation. The Cathedral, however, reaches beyond not just one congregation but also one church and has become a centre for Latvian Christians, with services often celebrated ecumenically by the heads of all Christian denominations. The Cathedral is a place where, independent of creed or other affiliation, any seeker is welcome. One of the universal languages of the Riga Cathedral is music. It has been present at services and events since 1884 when the then largest organ in the world, sporting about 7 000 pipes and 124 stops, was built. For the organ consecration service, Franz Liszt wrote a special piece – prelude to the choral Now Thank We All Our God. The rich music traditions of the Riga Cathedral are being continued to this day both at services and weekly concerts as well as international events with a special selection of music and quality performances. There was a time when the Riga Cathedral School marked the beginning of organised education in Latvia. The Cathedral is still a place to discover the unknown. That is reflected both in spiritual life and collaboration with various educational institutions, particularly the Riga Cathedral Choir School. The education of Latvian organists is also closely tied to the Riga Cathedral and its pipe organ. The architecture of the Cathedral has not changed substantially since the 13th century, yet each century has left a mark of its own: the 15th century was responsible for the creation of the side chapels and elevating the side walls of the central nave, the 18th century saw the building of the spire in its present form, whereas the cross-nave underwent many reconstructions until the 19th century when the first Riga museum found a home within the premises of the Cathedral. The oldest interior objects have been preserved since the 16th century. The stained glass windows and paintings guard the rich evidence of artistic life of the 18th and 19th centuries. The gravestones and epitaphs serve both as witnesses to the glory and influence of a person during their lifetime and as reminders of their demise. The modern history of the Latvian nation is likewise connected to the Cathedral: here a worship service launched the formation of the Popular Front, it played an important role during the barricade period in 1991, and it is the place of national independence celebrations nowadays. The Riga Cathedral is an important witness of the ages, people, and eternity.